The top two header area widgets called Header – Left and Header – Right are capable of handling any sort of widget. It can be a Custom Menu, Text, or Search, for example. If Custom Menu / Navigation Menu widget is assigned with a menu called “Social”, it will automatically show social media icons – as mentioned in the “Social Media Menu / Icons” section. If it is a menu called anything other than “Social”, it will display as a normal text menu such as the one displayed in our demo on the top left. Go to Appearance > Menus, and add a new menu. You can add posts, pages, custom links, categories, etc. to this menu. For more information on how to create menus, please read https://codex.wordpress.org/WordPress_Menu_User_Guide. 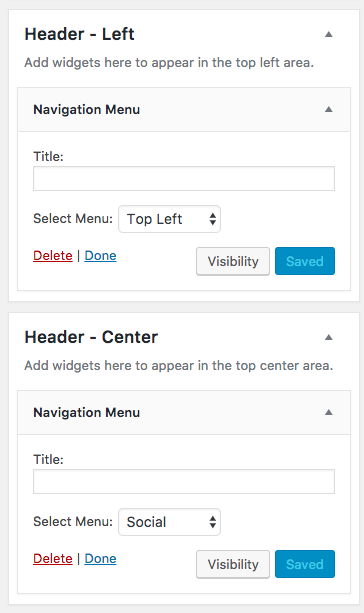 Then go to Appearance > Widgets and assign the Navigation Menu widget to the Header - Left area. Select the menu you just created for this area (in step 1 above) and hit Save. These are the settings for the widgets in our demo.